The oval shaped arena, widely known as the North Charleston Coliseum, is a multi-purpose arena situated in North Charleston, South Carolina. The facility hosts concerts, comedy shows, and diverse range of other events. Home to the South Carolina Stingrays ice hockey team, the Coliseum has also served as the venue for several televised events. Artists including the Eagles, Elton John and Oprah Winfrey have graced the stage at the facility with their performances. Built in 1993, the North Charleston Coliseum is part of the North Charleston Convention Center Complex, which also includes a Performing Arts Center. The Performing Arts Center and Convention Center opened in 1999. The 14,000-seat multi-purpose arena is located on the access road to the Charleston International Airport, and the North Charleston Coliseum, North Charleston Convention Center, and the North Charleston Performing Arts Center is owned by the city of North Charleston and managed by SMG. The Performing Arts Theater has 2,300 cushioned seats with full production capabilities and it features an in-house sound system and equipment including ADA hearing assists, in-house lighting systems and spotlights. There are two loading docks and a complete rigging grid, eight dressing rooms, and the stage is 110' x 40'. The North Charleston Coliseum facilities include a Staging/Loading Area where there is secured truck and bus parking, electric, telephone and water hookups, and a loading dock with leveler plate; Dressing Rooms- 4 Team rooms, 2 large dressing rooms, and 3 Star dressing rooms, all having private bathrooms and showers; Additional Rooms like 1 Green room, 1 Media room, and 2 Production offices. The arena seats up to 14,000 people and consists of state-of-the-art audio-video facilities that help in adding to the mood of the events. North Charleston Coliseum is available for sporting events, concerts, meetings, conventions and exhibitions. Artists and events such as Amy Grant, The Eagles, Bruce Springstein, and Elton John, Walking with the Dinosaurs and Oprah Winfrey, are just a few names that the North Charleston Coliseum has featured. Other than this, the Coliseum has also served as the venue for several televised events, which include WWF In Your House pay-per-view, WCW Uncensored, Wheel of Fortune, and the 2007 American Idol auditions. As responsible for hosting a wide and diverse range of events, North Charleston Coliseum is also home to the South Carolina Stingrays ice hockey team, which started as soon as the Coliseum opened, whereas, the Coliseum is the alternate home arena for the Charleston Southern University basketball team. Charleston Southern University uses the Coliseum for non-conference games that draw large audiences, such as when they play College of Charleston, The Citadel, and Virginia Tech. In addition, The North Charleston Coliseum has hosted the Big South Conference, 1993-94, and the Southern Conference basketball tournaments. The upcoming events at this marvelous multi-purpose arena, the North Charleston Coliseum, include South Carolina Stingrays vs. Charlotte Checkers, South Carolina Stingrays vs. Mississippi Sea Wolves, South Carolina Stingrays vs. Gwinnett Gladiators, South Carolina Stingrays, and more of sprting events, along with, other entertaining events like Celtic Woman : Isle of Hope, Jeff Dunham, Yanni Voices, Cirque Du Soleil : Saltimbanco, and a lot more! Book your tickets for the great line-up of these upcoming events and have a true memorable experience! The average North Charleston Coliseum Tickets price will cost you between $104 and $523, if you are looking for the cheapest seats then catch the event being held at the North Charleston Coliseum, North Charleston on 23/08/2019. The average ticket will cost you the highest on 08/08/2019 at the North Charleston Coliseum, North Charleston. Minimum get in price is for North Charleston Coliseum Tickets is $40 for the event being held at the North Charleston Coliseum, North Charleston on 01/11/2019 , there are some venues that have a much higher get in price, for instance the cheapest seats at the North Charleston Coliseum, North Charleston on 08/08/2019 will set you back $132. Is it safe to buy North Charleston Coliseum Layout tickets online? What are your best prices for floor seat circus tickets north charleston sc event? Hi there! 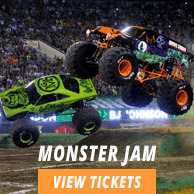 can you give me the monster nation monster trucks coupon code north charleston? For complete details about North Charleston Coliseum Tickets and their prices, please log on to our website or call us on our toll free number for further assistance. Yes it is safe to buy North Charleston Coliseum Tickets online from us as we offer hacker free facilities and are certified by recognized authorities. Respected Sir/Madam! Contact the live operator for your exclusive North Charleston Coliseum promo code.